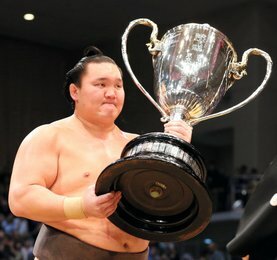 Le grand champion Hakuho a prolongé son record avec une huitième victoire en battant Hokutofuji (6-2) en un clin d’œil. Hakuho est toujours sur la bonne voie pour remporter un 40e championnat. 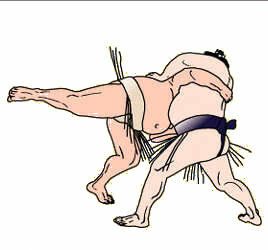 Les deux lutteurs se sont accrochés au mawashi de l’un et de l’autre, mais la main gauche de Hakuho sur le bras de Hokutofuji a pris le dessus. 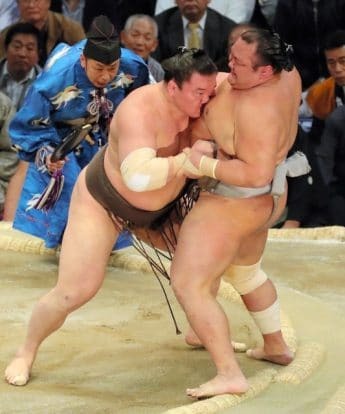 Le yokozuna a une fois de plus fait étalage de son habileté et de sa confiance pour pousser son adversaire hors du dohyô. 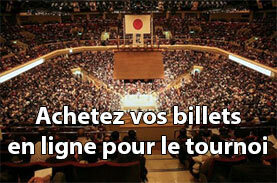 Pendant ce temps, le yokozuna Kisenosato (4-4) continue de souffrir. Il a subi aujourd’hui sa deuxième défaite consécutive en étant expulsé de l’anneau par le maegashira 4 Ichinojo (7-1). Ichinojo, accompagné de Okinoumi et de Arawashi, suivent Hakuho de près avec sept victoires. Okinoumi (7-1) a battu Daiamami (2-6) tandis que Arawashi (7-1), a quant à lui triomphé de Chiyomaru (3-5). Le vétéran Aminishiki (6-2), a subi sa seconde défaite en s’inclinant face à Endo (5-3) qui l’a poussé vers le bord. Le maegashira âgé de 39 ans a tenté de s’accrocher, mais Endo l’a poussé pour sceller la victoire en quelques secondes. Le maegashira 11 Aoiyama (2-2-4) a rejoint la compétition aujourd’hui après s’être retiré en raison d’une blessure à la cheville survenue lors de deuxième journée. Aoiyama, qui a reçu un prix spécial pour son esprit combatif en juillet, a fait un retour en force en s’imposant face à Daishomaru (2-6). Goeido (6-2) a battu Chiyonokuni (1-7) avec une poussée frontale et égalise son score avec cinq autres lutteurs. L’ôzeki kadoban Takayasu (5-3) s’est fait sortir par le sekiwake Yoshikaze (4-4). Grand champion Hakuho extended his spotless record after the eighth day of the Kyushu Grand Sumo Tournament on Sunday, taking down Hokutofuji in a blink. 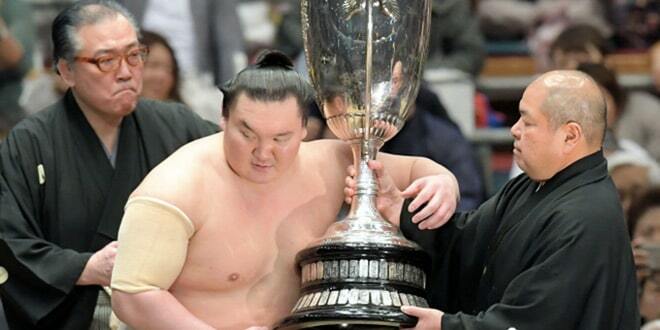 Hakuho is still on track for a record 40th championship after defeating No. 3 maegashira Hokutofuji (6-2) in the 15-day event at Fukuoka Kokusai Center. 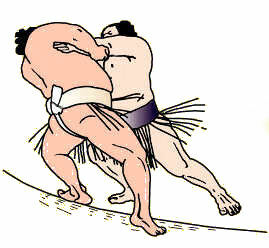 The two wrestlers held onto the other’s mawashi belt, but Hakuho’s left-handed grip over Hokutofuji’s arm proved superior. 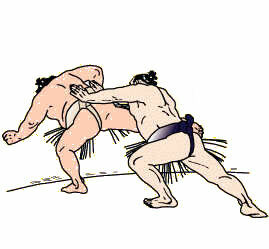 The Mongolian yokozuna then displayed his skill and confidence in nudging his opponent over the straw bales. 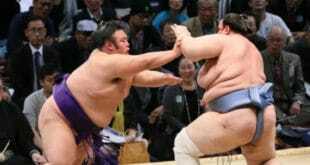 Meanwhile, yokozuna Kisenosato (4-4) continued to suffer. He fell to his second consecutive loss when he was forced out of the raised ring by Mongolian No. 4 maegashira Ichinojo (7-1). Ichinojo, as well as two others — No. 12 maegashira Okinoumi and Mongolian No. 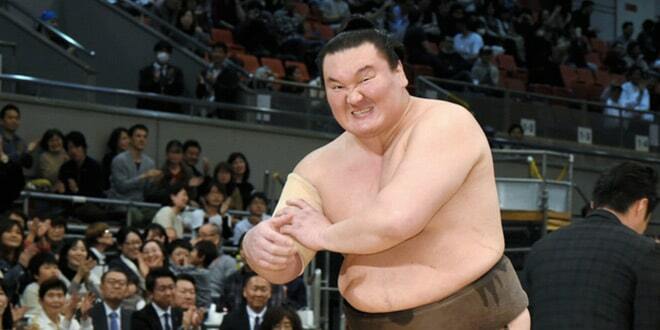 5 maegashira Arawashi– trail Hakuho by one win. 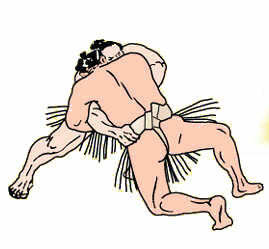 Okinoumi (7-1) was surrendered a belt hold to No. 14 maegashira Daiamami (2-6), but Daiamami, a debutant in the elite makuuchi division, stepped out while being pushed backward by Okinoumi. Arawashi (7-1), meanwhile, took down No. 8 maegashira Chiyomaru (3-5). Earlier, fan favorite Aminishiki (6-2) suffered his second loss of the tournament when popular No. 9 maegashira Endo (5-3) charged him toward the edge. The 39-year-old No. 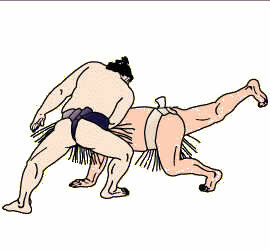 13 maegashira tried to cling on, but the 27-year-old Endo pushed him in the chest to seal the win in seconds. 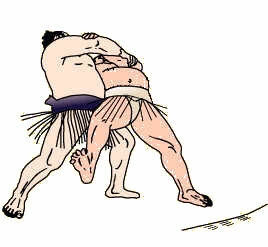 The competition is being held in the absence of six wrestlers including yokozuna Harumafuji and Kakuryu. No. 11 maegashira Aoiyama (2-2-4) returned to the raised ring after withdrawing due to a right-ankle injury sustained on the second day. Aoiyama, who received the Fighting Spirit Prize at the July tourney, when he went 13-2, made a strong comeback when he slapped down No. 7 maegashira Daishomaru (2-6). 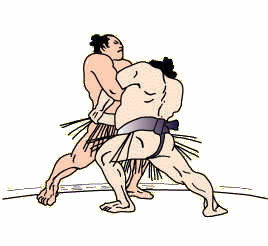 Ozeki Takayasu and Goeido, who both started the day at 5-2, experienced different results. Goeido (6-2) beat No. 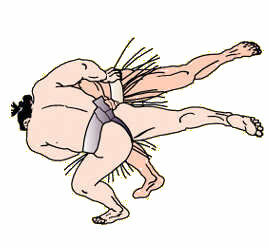 4 maegashira Chiyonokuni (1-7) with a frontal push out to drop into a tie with five others. Takayasu (5-3), who fights as a demotion-threatened « kadoban » ozeki, fell forward on his hands when trying to stop sekiwake Yoshikaze (4-4) from slapping him.